Article written by Scott SWCD staff. Once the water receded after the flooding in 2014, Chris Short went out to survey the damage in his backyard. It was worse than he expected. 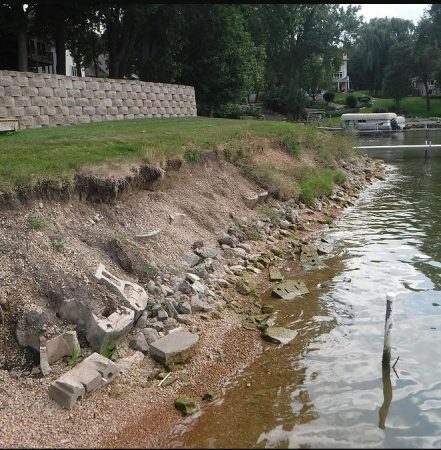 The retaining wall that was installed in 1990 to keep the shoreline in place, was now sitting in a heap on the edge of Prior Lake. The photo at right was taken in August 2016. The high-water levels during the 2014 flood caused the wall to collapse, leaving the bank completely exposed. The edge of the lawn that had been against the wall was now breaking off in chunks and falling into the lake. He knew he needed to take action because the erosion was not going to stop on its own. Chris did not necessarily like the idea of putting in another retaining wall because the last one failed when it was needed most. Chris wanted something that would look nice and require minimal maintenance, plus stand up to flooding, wave action, and overland flow. After asking around to see who could help him with his shoreline, Chris was directed to the Scott Soil and Water Conservation District (SWCD) in Jordan. He attended a free shoreline stabilization workshop they held in the fall of 2016 and began to work with Scott SWCD employee Todd Kavitz. Todd proposed reshaping the shoreline to make it less steep, then planting the area to native plants. Native plants have very long roots, which make them great shoreline stabilizers because those roots hold the soil in place. Plus, once established, native plantings have beautiful flowers and are great wildlife habitat. Chris liked the idea because it would “create a natural setting while helping to clean up Prior Lake.” The Scott SWCD worked with Chris to create a design for the shoreline that would work for him and fix his erosion problem. Scott SWCD assisted Chris in applying for cost-share for 75% of the cost of the shoreline stabilization project, which he received. The cost-share funds were made available by the Prior Lake Spring Lake Watershed District. Because of the technical and financial help Chris received, he was able to naturally stabilize his shoreline. The photo at left was taken August 2018. The area was regraded and planted to native seeds in June of 2017. This spring 72 native plant plugs were added near the bottom of the shoreline for additional stabilization. Native plantings take a few years to get established, and just over a year has passed since Chris seeded his shoreline. Chris has had to do some work on his shoreline this summer, including clipping the planting down before the weeds in the planting went to seed. With a few more years of maintenance, the shoreline will become even more beautiful and will continue to stabilize the shoreline for years to come. For Chris, putting in a native shoreline is worth it because the native plants are good for the lake and he gets to see the flowers in bloom. 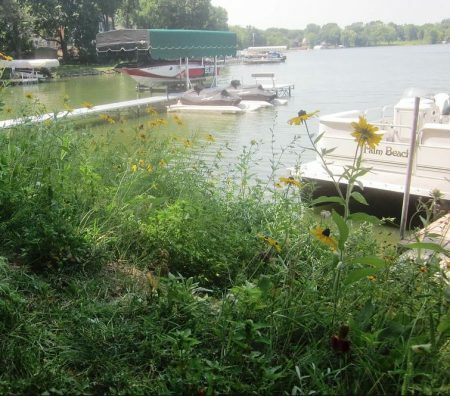 If you live on a lake and would like to create a more natural shoreline, contact the Scott SWCD at 952-492-5425. They can help you design a native shoreline that works for you, and financial assistance may be available. You can do your part for water quality and beautify your shoreline!